After realizing how difficult it is to work around zippers in my last project, I decided to forge ahead and tackle the dreaded zipper in a skirt that was all but finished. It turns out I spent a lot more time worrying than I actually needed to. Do not fear the zipper (if you have the right equipment). This skirt is thanks to the fine direction of Cal Patch in her book, Design-it-Yourself Clothes: Patternmaking Simplified. I am not a skilled seamstress. I only started sewing last year, and at that point it was strictly knits (because they stretch. Stretch = forgiveness). This whole world of sewing with woven fabrics is new to me. And scary. But it’s really fun. It’s even more fun to get a handle on creating patterns. And it’s wonderful to have voices out there like Cal Patch and Wendy Mullin who develop really great, easy books to help a frightened little newbie like me find her way through a project. You can’t see every detail in the picture. The less visible details are the heavy 1.5 inch folded hem and an invisible zipper along the left side. Since I drafted this skirt pattern based specifically on my measurements and preferences, it’s quite a nice fit. While the waist should probably sit higher, it felt really nice to wear a skirt that sat low on my hips, just skimming them instead of cutting into my skin. I’m looking forward to moving forward and enhancing this skirt pattern with a waist band, but am even more excited to move on to the next project in the book — a shirt. The fabric in this skirt came from a vintage dress my mom gave to me last summer. Again, as all vintage seems to be, it fit well everywhere but my waist. I had believed this dress to be homemade until I started to take it apart and found an International Ladies Garment Workers Union label in the seam. From the design of the logo, the dress and fabric appear to be from the late 1950’s or early 1960’s. I love that 50 years later the weave of the fabric is flawless, there are no stains and it has a new life as a skirt I’m sure I’ll continue to wear for quite some time before it takes on another life down the road. 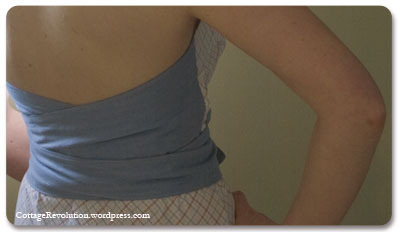 I thought of you this weekend when I cut the sleeves and neck ribbing off an old shirt to make it more comfy. Not quite high fashion work, but it was fun and doesn’t look too terrible. MK, this would be the perfect post-pregnancy skirt for you then.